Combine all dry rub ingredients. Set aside. Rub steak with 1 ounce garlic paste on front and back. To prevent burning, do not get garlic paste on bone. Divide dry rub seasoning for four steaks and thoroughly rub each steak and place in GLAD® Food Storage Container in refrigerator for 3–4 hours. This can be done up to one day in advance, or longer if you prefer. 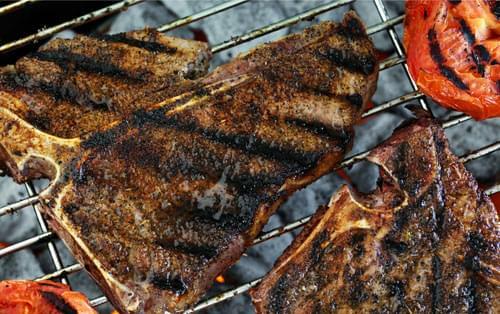 Put steaks on the grill and leave in one position on direct heat for 4–5 minutes, rotating to get nice grill marks and even flavor profile. If you follow this timeline, that size steak should be a perfect medium rare. Credit: Recipe created by Chef Eric Lackey of Flamestone American Grill in Oldsmar, Florida on behalf of the Walmart Choice Steak Challenge presented by Kingsford® charcoal and Coca-Cola®.